We operate an appointment booking service and a free retest within 10 working days. An MOT test is required on all vehicles when they become three years old from the date of registration and every year thereafter. Don't leave it until the last minute and cause yourself stress, an MOT can be carried out and forward dated upto one month in advance. In the unfortunate event that your car does fail we will be happy to quote on the work required to get the vehicle through its MOT. Our experienced mechanics are able to service and repair most makes and models of cars and light commercial vehicles to a very high standard. 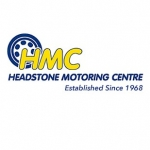 We have a wide range of specialist tools to carry out all types of repairs such as headgasket and timing belt replacement as well as the usual brakes, radiators exhausts, suspension etc, etc. We have specialist diagnostic equipment to scan most vehicles engine, airbag and ABS systems. We can regas your airconditioning adding a fluro dye to help detect future leaks. If your system requires any replacement parts we can also carry out the necessary repairs. We can carry out all manner of bodywork repairs from minor scratches/bumper scuffs to major insurance work. We can email estimates direct to your insurers and liase with them on your behalf to help speed up the claims process. All work is guaranteed. We are now in a position to offer the fitting of alarms, front & rear park sensors, rear view cameras, satellite navigation systems, trackers, in car entertainment systems, phone kits and towbars. We can carry out all kinds of upholstery repairs from cigarette burns to seat repairs and conolising. We can ply line your van and fit security locks too. We pride ourselves in offering a value for money, professional and courteous service to all our customers in the hope we earn their trust to continually maintain their vehicles. Your feedback is always welcome as to how we can improve the service we provide. 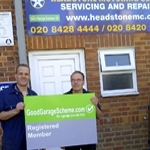 Due to our high standards we have been specially selected to become a member of the Good Garage Scheme - a national organisation set up to help you find a good local garage click http://www.goodgaragescheme.com for more details. Our highly experienced and qualified mechanics are able to service and repair most makes of cars and vans to a very high standard. Our service schedules are very comprehensive. Covering many points on the vehicle to ensure safe motoring and are carried out in line with goodgaragescheme.com guidelines. We will always ring you to authorise any additional work required that wasn't agreed at the time of booking. An MOT test is required on all vehicles when they become 3 years old from the date of registration and every year thereafter. Don't leave it until the last minute and cause yourself stress. An MOT can be carried out and forward dated up to 1 month in advance. In the unfortunate event that your car does fail we will be happy to quote on the work required to get the vehicle through its MOT - free retest within 10 days. Any minor repairs to lights, Wipers, Emissions etc, can be carried out at the time of test. We offer an appointment service, which appeals to the majority of our customers. As we have good parking facilities if you like to leave your car all day and collect it after work up until 6pm.